When getting Florida moving quotes for your upcoming move, there are a few things that you should consider. Today we’re talking about what those things are and why it’s important to consider them before choosing a moving company. 1. Are You Signing Complete Documents? When you seek out a moving quote, you may need to sign a document committing to using the company’s moving services. When you sign this document, it’s important to read it thoroughly and make sure that you aren’t signing incomplete documents or a blank contract that will allow the moving company to fill in information at a later date. When you approach a moving company for a quote, you’re going to get a much more accurate quote by having the moving company employee do a walkthrough of your home first. This will give them a much better idea of how much they will need to move for you so that they can give you an accurate price. 3. Are You Being Given an Inventory List? Reputable moving companies will give you a full inventory list of items that they will move. The company has one of these lists for themselves and if they don’t offer you one, you can request a full copy of one. Look over the list carefully and make sure that it is accurate and covers everything you want the moving company to move for you. 4. Are You Being Given a Binding or Non-Binding Quote? We have written about binding versus non-binding quotes here on our blog before, but if you need a refresher, check out that post here. Make sure that you explicitly ask whether a quote you receive is binding or non-binding before you agree to the terms of the move. 5. Are There Additional Costs? Your moving estimate should include the full cost of your move, but it’s always prudent to ask your moving company ahead of time if there are any additional costs that you can expect. Are there any fees or unlisted charges that they have not yet covered with you but that you will be expected to pay when your moving day arrives? 6. Are There Limitations on Services That You Should Know About? Sometimes there are limitations on services that are provided by a moving company and anything that exceeds these limitations with either incur an additional fee (which should be noted on your estimate) or will not be done for you. For example, your estimate may only cover moving furniture up or down one flight or stairs or only cover a short walk from the moving truck to your new home. If your movers have to tackle additional flights of stairs or have to park further away, you may run into additional charges or other issues. It’s important to know about this ahead of time so that you can make the necessary arrangements. 7. Are Your Movers Licensed, Bonded, and Insured? ALL movers should be licensed, bonded, and insured, if a company you are considering is not, then find another moving company! Not sure what it means for a company to be licensed, bonded, and insured? Check out our article about just that! 8. Are You Comfortable With the Movers? Once in a while you will get a gut feeling about someone, something, or a company. When it comes to requesting Florida moving quotes if you get a feeling that something just isn’t right or you don’t feel comfortable around the moving staff there, walk away. Here at Big Boys Moving and Storage we always do our best to make every one of our clients feel welcome and safe with our staff members in their home, we believe that every other company should do the same! 9. Are They an Experienced Moving Company? New companies aren’t necessarily bad companies, but if you’re looking for a reputable moving company you’re always better choosing one that has experience. Not only does an experienced company have an established local position so you know they won’t disappear overnight, but they also have references in the community. This way you can check on a moving company by talking to people who have used them before and find out just how diverse their moving portfolio is. A cancellation policy is in place to protect both you and your moving company and it’s important that you are familiar with this policy before you hire a company. If your move date changes, what type of advanced notice do you have to give? If you don’t give that length of notice, what penalties are you facing? What happens if your movers have to cancel on you? What is their policy for notifying you of cancellations ahead of time so that you aren’t stranded on moving day without a moving truck? Cancellations aren’t too common when it comes to professional moving companies and moving homes, but sometimes things do come up. A reputable company should have a REASONABLE cancellation policy in writing that they can provide to you at the time that you sign your moving contract with them. This should outline specifically how much notice is required for cancellation and any potential penalty associated with that cancellation. Keep a copy of this policy and your estimate and inventory list on hand when moving day arrives. For easy access, keep all of this important paperwork in a three-ring-binder in your car. Looking For Reliable Florida Moving Quotes? 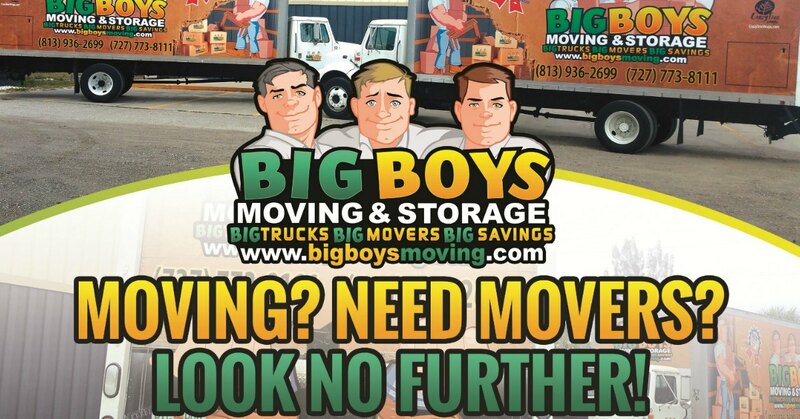 If you’re looking for a reliable Florida moving quote from reputable movers who have decades of experience then Big Boys Moving and Storage can help! Just pick up the phone and give us a call at 813-936-2699!